Electrocoagulation (EC), the passing of electrical current through water, has proven very effective in the removal of contaminants from water. Electrocoagulation systems have been in existence for many years (Dietrich, patented 1906), using a variety of anode and cathode geometries, including plates, balls, fluidized bed spheres, wire mesh, rods, and tubes. GPi-ECpw has taken a quantum leap in refining the EC process to increase removal rates and to lower capital and operating costs. “The Electrocoagulation process is based on valid scientific principles involving responses of water contaminants to strong electric fields and electrically induced oxidation and reduction reactions. This process is able to take out over 99 % of some heavy metal cations and also appears to be able to electrocute microorganisms in the water. It is also able to precipitate charged colloids and remove significant amounts of other ions, colloids, and emulsions. When the system is in place, the operating costs including electric power, replacement of electrodes, pump maintenance, and labor can be less than $1 per thousand gallons for many applications. Coagulation is one of the most important physiochemical operations used in water treatment. This is a process used to cause the destabilization and aggregation of smaller particles into larger particles. Water contaminants such as ions (heavy metals) and colloids (organics and inorganics) are primarily held in solution by electrical charges. Schulze, in 1882, showed that colloidal systems could be destabilized by the addition of ions having a charge opposite to that of the colloid (Benefield et al., 1982). The destabilized colloids can be aggregated and subsequently removed by sedimentation and/or filtration. Coagulation can be achieved by chemical or electrical means. Chemical coagulation is becoming less acceptable today because of the higher costs associated with chemical treatments (e. g. the large volumes of sludge generated, and the hazardous waste categorization of metal hydroxides, to say nothing of the costs of the chemicals required to effect coagulation). Electrocoagulation can often neutralize ion and particle charges, thereby allowing contaminants to precipitate, reducing the concentration below that possible with chemical precipitation, and can replace and / or reduce the use of expensive chemical agents (metal salts, polymer). - Dissolved silica, clays, carbon black, and other suspended materials in water are generally reduced by 98%. - Heavy metals in water such as arsenic, cadmium, chromium, lead, nickel, and zinc are generally reduced by 95 to 99%. Note: Heavy metals processed with sufficient activation energy precipitate into acid resistant oxide sludge like NiFe2O4, that pass the Toxic Classification Leaching Procedure (TCLP) which allows the sludge to be reclassified as non hazardous (Renk, 1989; Franco, 1974; Watanabe and Nojiri, 1975; Duffey, 1983). G. EC induced pH swings toward neutral. The process is optimized by controlling reaction chamber materials (iron, aluminum, titanium, graphite, etc. ), amperage, voltage, flow rate, and the pH of the water. The technology handles mixed waste streams (oil, metals, and bacteria), very effectively. Variables such as temperature and pressure have little effect on the process. The best way to understand what will happen with a specific water is to test that water in the EC reaction chamber. - Recycle water, allowing closed loop systems. - Remove metals, and oil from wastewater. - Recondition antifreeze by removing oil, dirt, and metals. - Recondition brine chiller water by removing bacteria, fat, etc. - Pretreatment before membrane technologies like reverse osmosis. - Precondition boiler makeup water by removing silica, hardness, TSS, etc. - Recondition boiler blow down by removing dissolved solids eliminating the need for boiler chemical treatment. - Remove BOD, TSS, TDS, FOG, etc., from wastewater before disposal to POTW, thus reducing or eliminating discharge surcharges. 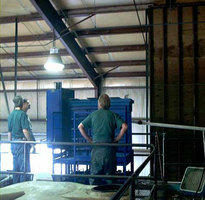 The operating costs of electrocoagulation vary dependent on specific water treated. For example, municipal sewage water was treated for $0.24/1,000 gallons, and steam cleaner water containing crude oil, dirt and heavy metals was treated for $0.05/gallon. 1. Dieterich, A. E., Electric Water Purifier, United States of America Patent No. 823,671 June 19, 1906. 2. Benefield, L. D., Judkins J. F. and Weand, B. L. 1982. Process Chemistry for Water and Wastewater Treatment. Prentice - Hall Inc., p. 212. 3. Woytowich D. L.; Dalrymple C. W.; Britton M. G.; 1993. 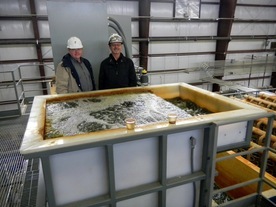 Electrocoagulation (CURE) Treatment of Ship Bilgewater for the U. S. Coast Guard in Alaska. Marine Technology Society Journal, Vol. 27, No. 1 p. 62, Spring 1993. 4. Renk, R. R. 1989. Treatment of hazardous wastewaters by electrocoagulation. In: 3rd Annual Conference Proceedings (1989). Colorado Hazardous Waste Management Society.